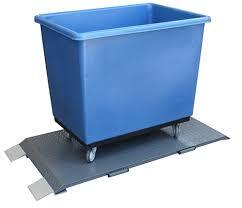 Place your laundry carts on the platform and get an accurate weight on large laundry loads. These laundry floor scales are ideal for industrial laundries, hospitals, hotels and resorts. Provides consistent accuracy within 0.1% and comes equipped with an indicator for fast digital read out. There are no installation requirements and no moving parts that require maintenance or adjustment. . No need for ramps or recessed floors, as these units come with ramped ends. Laundry carts not included. • Rugged steel with tread platform. • Model S1000 has 1000 lbs. capacity x 1 lb. increments (also available in 2000 lb. capacity — same price). Model S5000 has 5000 lbs. capacity x 1 lb. increments. • Adjustable foot pads allow scale to work effectively on uneven floors. • Operates on four AAA batteries or 6V DC, 500mA adapter, both included.